Sonny Boy Spiritual Product High John Conqueror, Get a Job! Keep a Job! Put your Lucky Mojo Hand Power to Work! SONNY BOY® High John the Conqueror. Sonny Boy High John the Conqueror spiritual and religious oils, incense, bath wash, salt crystals, sand, bar soap, spray and spiritual faith candles. Problem Solver! Drugs! Drinking! You Must Have Faith In A Higher Power. Dress a white cloth or a cross with any HIGH JOHN CONQUEROR item. Bless with HOLY WATER. Use the cloth for your family or your home, or your job. Use HIGH JOHN CONQUEROR with MONEY, LUCK items, or LOVE items. Use HIGH JOHN CONQUEROR with CONTROLLING items and JOB. Also protects from anything coming back on you. When something has happened to get your life all messed up, light 3 High John Conqueror Candles, and let them burn out. Pray over the candles every time you get a chance, be sure to ask for the the blessing you need. High John Conqueror is a super communicator. Hard Worker...a Miracle Worker "Sonny Boy, you saved me from self destruction with drugs and alcohol. High John Conqueror is all powerful! I will always be in your debt." L. Jefferson, Bronx ,NY. SONNY BOY says, always use a kit for strongest action. SONNY BOY® Road Opener spiritual and religious oils, incense, bath wash, salt crystals, sand, bar soap, spray and spiritual faith candles. Road Opener- Don't Let Anyone or Anything Stand In Your Way! Move Anyone or Anything Out of Your Way! Unblock Your Path! Open the Road to Job, Money, Special Favor, Position! Pass the shoes you will wear when you are working on your need thru the smoke of ROAD OPENER CANDLE, or INCENSE daily. Spray your feet and hands while repeating your objective. Write the address on parchment paper and burn in incense daily. The more items you use the stronger the action. SONNY BOY says, use with STEADY WORK for quick action when your job situation needs improving! SONNY BOY says, always use a kit for strongest action. SONNY BOY® Do As I Say spiritual and religious oils, incense, bath wash, salt crystals, sand, bar soap, spray and spiritual faith candles. Do As I Say - For A Specific Action! Cause Someone to Change Their Mind - Make a Child, Friend, Mate Tell the Truth. Stop A Creditor from Harassing You! Stay Away From My Mate! Away From My Family! Reflect their image, or draw an image, and say out loud the action you want them to take. SONNY BOY says, always use a kit for strongest action. SONNY BOY® Controlling and Compelling Power. Use Sonny Boy spiritual and religious oils, incense, bath wash, salt crystals, sand, bar soap, spray and spiritual faith candles. Control Another Person's Actions. Compelling Power. Compel Them To Do Your Will, Job, Court, Family. When you will come in contact with the person, write their name 3 times inside a circle on white paper. Anoint your palms with oil and rub the paper between your hands, say their name out loud 3 times. SONNY BOY says, always use a kit for strongest action. SONNY BOY® Give Me Money Power spiritual and religious oils, incense, bath wash, salt crystals, sand, bar soap, spray and spiritual faith candles. Give Me Money, Compel Your Mate To Give You Money, Car Payment. Draw their image on paper. Write their name 7 times on the image, anoint with oil. Say their name out loud, and the money you need. Anoint something personal of theirs with PSYCHIC VISION oil or spray. It is a Drawer! Good with Do As I Say or Controlling power product. SONNY BOY says, always use a kit for strongest action. Sonny Boy Spiritual Products have controlling and compelling powers not found in any other product. 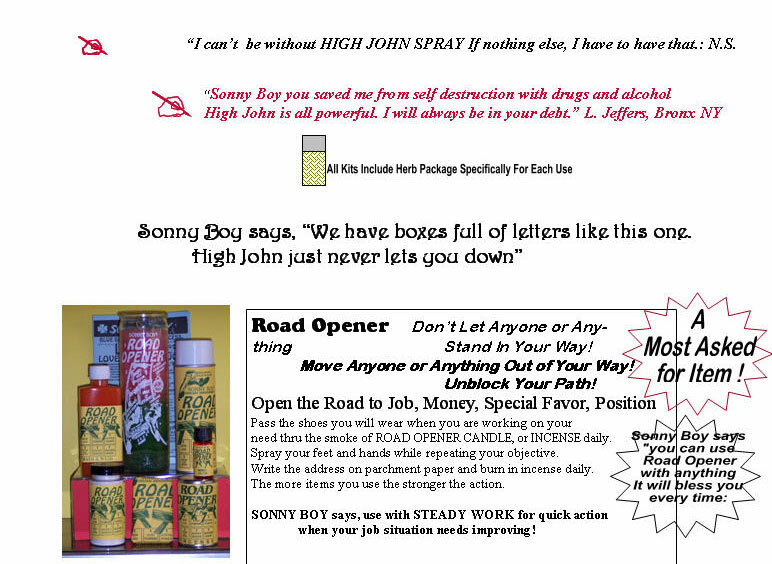 Sonny Boy Stay High John the Conqueror products are the absolute best of any item. 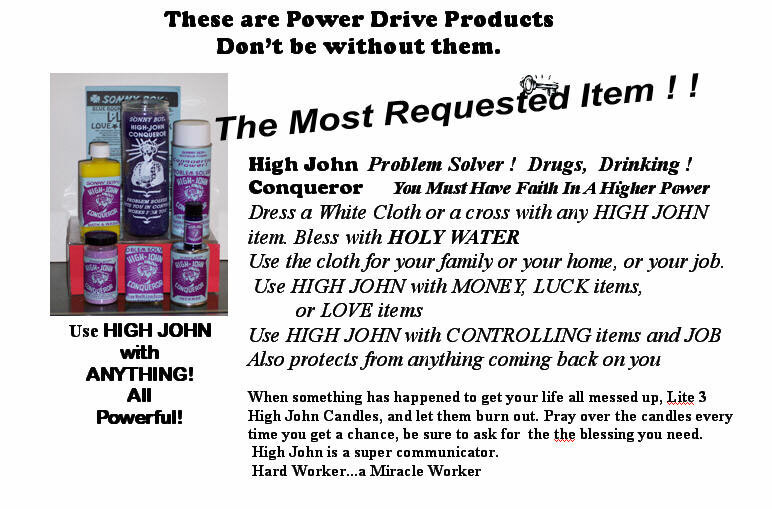 You can use High John with any product in our line. When you add the Do As I Say and Controlling items, you can cause any situation to go your way. High John with Road Opener items can secure success, recognition, prosperity. Burn Sonny Boy Novena Candles, use the incense and oils and other items in the kits. You will draw the blessings you need.